We have at least one contender in this race whose connections will have designs on getting to the Champion Hurdle March in the shape of Verdana, though once more we have a good value selection among our six against the field for this Grade 3 hurdle. Nicky Henderson’s 5yo has not only started well in each of the last two seasons but has in fact improved a fair amount and as such is expected to go very well in this. There is some doubt over the track for the son of Anabaa Blue who wasn’t trusted to run when it turned soft here last January while he ran slightly below par at last year’s Festival in the Triumph Hurdle before pulling up in this year’s Champion Hurdle, albeit as a 100/1 shot. The danger for us with horses like this from stable’s such as Peter Atkinson’s is to underestimate them, so as a two-mile bumper winner at Cheltenham we need to ensure we are taking him at full face value. His best still leaves him with a little to find in this company however after he finished last season sixth in the Scottish Champion Hurdle (1lb lower now) which was his best run while he started this campaign third of 6 at Wetherby when pretty well fancied. If he takes a step forward he has a definite place chance but he doesn’t scream “winner” at the weights on this occasion. This is another one we’re unsure about around this demanding track, though it must be said he stayed on beautifully up the hill at Newcastle on his bumper debut while last time at Wetherby he couldn’t quite get to the winner, something he may have done had his conqueror had a more demanding finish to face. He finished last term by winning the Scottish Champion hurdle and his rise of 7lbs in the weights since then may only just about reflect his improvement over that time, though this still demands plenty of him with others perhaps just a little better handicapped at this stage. A really interesting runner who has improved no end since joining Dr Richard Newland’s stable from Denis Hogan over in Ireland. His easy win at Wetherby last time was simply a case of the yard making hay while the sun was shining and so a better form line is to go back to his stable debut in October over today’s track and trip of 2m+. That day he beat 15 good rivals in very, very easy fashion making his actual level hard to ready other than knowing he is capable of much better than the bare form he had to show that day. He’s a full stone higher in the weights now but is ready for a proper challenge which this race provides. 5lb claimer Charlie Hammond rides again. Last weekend’s Elite Hurdle winner did the job nicely at Wincanton but it’s noted that despite running fourth and third in good races at Cheltenham, he hasn’t gone forward and reached the expected level when going round here which is a slight concern. 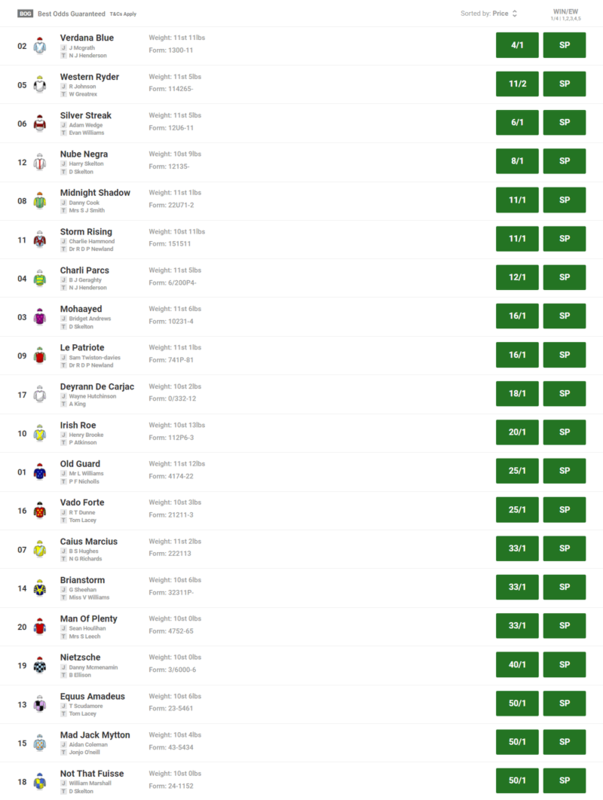 Strictly at the weights Nicky Henderson’s runner is right there with the best of them in this field and as a representative of the top yard is bound to be popular in the market, though with a few chinks in his armour we perhaps can’t be taking shortish prices about him. Warren Greatrex’s runner has gone off a strong favourite for each of his last two seasonal debuts but was beaten fair and square two years ago and unseated last year, giving us doubts as to his full wellbeing before he’s got his eye in. This is only his 8th race over the timber though and he’s going the right way so with Richard Johnson on board he will rightly prove popular in the market. Western Ryder, if fully ready to rock ‘n roll first time out, looks set to challenge for place money but all things considered it’s hard to split two others at the head of this race. Verdana Blue looked good when winning the Elite Hurdle but may or may not appreciate this course fully, ran only 8 days previous and has to carry a burdensome 11st11lbs. The improving STORM RISING however has plenty in his favour and rates a good value selection to score.